One of the major advantage and feature that been introduced since IE9 (Internet Explorer 9) is GPU (graphics processing unit) hardware acceleration to speed up performance when using IE for graphics-heavy tasks like video streaming or online gaming. IE hardware accelerated graphics support is built on Direct2D, and hence for the hardware rendering to work, the graphic card must support Direct3D 10.1 and/or Direct3D 10 Feature Level 9 with WDDM 1.1 drivers. Old computers with older generation of GPU graphics card may not be able to meet the system requirements of IE9 in order to enable and turn on hardware accelerated graphics rendering. For example, there are still many graphics card which supports only DirectX 9 (DX9) especially integrated display card such as ATI Xpress Radeon X1150, Intel GMA 945 and etc. As a result, IE will fallback to software rendering emulation, and the “use software rendering instead of GPU rendering” option of accelerated graphics is checked (ticked). The check box for the option is grayed out and unchangeable so user cannot unselect the option. 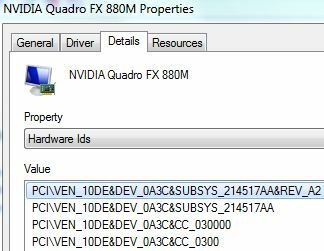 Here’s the trick to hack enable and force IE9 (or later IE versions) to use GPU hardware acceleration to render graphics on non-DirectX 10 (DX10) support graphics processing unit. However, do note that the trick may or may not speed up Internet Explorer, as the hardware acceleration still depend on the GPU features after all. Some IE users may experience increase in graphics displaying metrics (tests available at http://ie.microsoft.com/testdrive/) such as FPS (frames per second), while others may make IE loading speed worse and lag. In Start Search, type Device Manager and hit Enter. Expand the Display adapters tree branch, and double click on the active graphics card. Note down the vendor ID (XXXX after the VEN_) and device ID (XXXX after the DEV_). For 32-bit (x86) operating system, modify the following registry value with data from display adapter’s vendor ID and device ID. For 64-bit (x86) operating system, modify the following registry value with data from display adapter’s vendor ID and device ID. IE will not try to use GPU hardware acceleration to render graphics and videos in IE. The check box for “use software rendering instead of GPU rendering” in “accelerated graphics” in Tools -> Internet Options -> Advanced tab is now unchecked and unselected, and the option is no longer disabled. Note that if you tick the check box to disable and turn off GPU accelerated rendering, you will need to perform the hack above to enable or turn on the display adapter hardware acceleration again. In addition, Internet Explorer may automatically disable and turn off GPU graphics hardware acceleration support, and in order to avoid the possibility, it’s recommended (if the hack does help in IE’s performance) to remove the ability for SYSTEM user to write and edit the HKEY_CURRENT_USER\Software\Microsoft\Internet Explorer\GPU registry key. To do so, follow the brief guide below at your own risk. Right click on “GPU” and select “Permissions”. Go to “Advanced”, and uncheck the “Include inheritable permissions from this object’s parent”. Then, add “Administrators” group or your user name and allows “Full Control” permissions, and (must) add in “SYSTEM” user with “Read” (at least Read Control and Query Value) privileges.